That's what I nearly caused when I called into this book club in Santiago, Chile last week. Can you blame me? It was during the horrendous cold snap we've been having. Now that the temps are moderating a bit, all is forgiven, ladies. 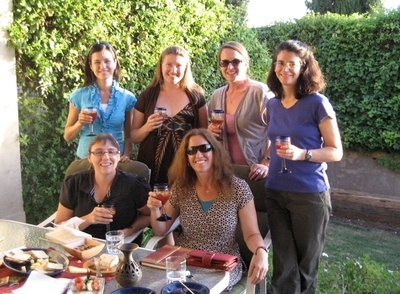 This book club consists almost entirely of teachers at an international school (one member is the wife of one of the teachers). They're on assignment from one and a few years and have lived/taught in such far flung places as South Korea, Trinidad, Pakistan, Kuwait, Sri Lanka, China, Indonesia and Paraguay. And, under the "It's a small world" catagory, Michelle, who arranged the call-in, actually went to the same high school - Great Neck South - that I did (although, ahem, just a fewl years later). When we hung up, we embarked on a hilarious and revealing recounting of our own road trips from college on - the triumphs, the disasters, the romances... We did this while drinking martinis and eating a chocolate pecan pie I had made - referencing chapter seven. All in all, your experience resonated with us and gave us the vehicle for lovely, lively, and intimate discussion. I love hearing that I've sparked eating, drinking and oh, yeah... discussion. This page contains a single entry from the blog posted on December 14, 2009 10:25 AM. The previous post in this blog was Come On PN, Light My Fire. The next post in this blog is Westerville Literary Society.